Today, we have a guest post from Bennett Lovejoy, one of our recent interns and a student at Northeastern University. Bennett applies Maslow’s hierarchy of needs to bimodal IT and digital innovation. 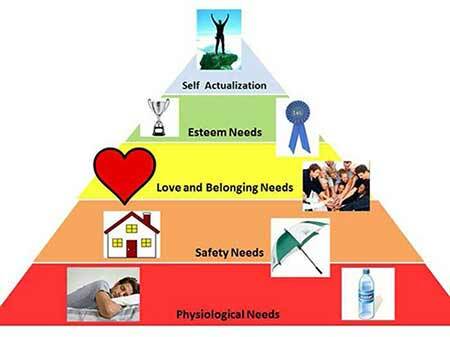 In 1943, Abraham Maslow created a theory that shows fundamental needs in the form of a pyramid; he said that the fundamental levels of the triangle must be satisfied in order for an individual to be able to focus on more complex needs. For example, someone must focus on physiological needs, such as thirst or hunger, before he or she can focus on self-esteem needs, such as buying a BMW. When a fundamental need is not met, a person won’t worry or think about more complex needs. The highest level of Maslow’s pyramid is self-actualization, which focuses on levels of intrinsic thinking that supersede personal issues. Someone who reaches the level of self-actualization is able to reflect upon his or her life and the way the world works. An example of this is when people decide that they want to be vegetarian because eating animals does not align with their moral values; if the same people were struggling to satisfy their physiological needs, they would not think twice about eating meat if it’s their only option for food. How does this connect to the success of businesses? It is often thought that an individual will have a higher quality of life and be more productive when they don’t struggle to satisfy basic needs. When someone is desperately stuck worrying about putting food on the table, he or she cannot focus on their sense of belonging, self-esteem, and self-realization. This causes them to neglect these other aspects of their life, ultimately stunting personal growth and development. A person who can easily satisfy these basic needs will achieve greater personal satisfaction, be more productive, and succeed. The same holds true for success within an organization. You need to satisfy the basic fundamentals of business operations, before extending your reach or innovating further. You can see this division best, often in IT groups. Traditional IT teams were responsible for managing critical business systems. They focused on maintaining processes and technology architecture so that the business continues operating effectively. Although this team focuses on supporting existing systems, business leaders are now turning to the CIO to leverage new, innovative technologies that will further drive business growth and competitive advantages. But finding time and resource to take on additional projects can be daunting. Ultimately, business demand for digital innovation is impacting the future structure of IT departments. While systems maintenance is still critical, the IT group must add another layer to their team. Similar to the Hierarchy of Needs pyramid, once traditional IT functions are established, the department can evolve to include a specific focus on new innovative technologies that impact the business’ future health and success. This can be represented by the adapted pyramid below. Gartner refers to this structure as Bimodal IT. And more and more IT departments are moving in this direction, due to its transformative qualities that improve operations. With a bimodal IT strategy, information technology departments appoint their staff to specialize in either maintaining the backbone processes that keep operations running (mode 1) or by seeking out digital technology opportunities that can make their business more efficient (mode 2). In result, IT personnel are able to focus on their strengths within an assigned role, yielding greater results for the company’s bottom line and preventing the missed opportunities of game-changing technology. Mode 1 development is on the bottom of the triangle because it’s the base and acts as the foundation of the IT department. This represents the CRMs, ERP systems, data warehouses, and core processing systems that companies feel they cannot operate without. This layer is essential to business success and is the foundation for the IT department. There are many people who excel in these areas and they should focus their time here. But the department as a whole can also ascend to a new level of business support, focused on digital innovation. The workers on mode 2 teams aren’t necessarily more skilled than the employees that maintain the foundation; both levels are equally important and essential for the success of a business. But we can recognize that the skills needed and resources required are different from mode 1. The mode 2 pyramid section is also larger which represents the tremendous potential available if the IT department is able to tap into digital innovation. Examples include new portals for customer self-service, advisement/guide portals for employees to find information, new tracking systems, and applications that are specifically targeted to assist departments within an organization; the possibilities are endless. Ultimately, the business landscape is changing whether companies are ready or not. It’s up to the CIO to position the company with the proper IT strategy that will optimize new technology and take advantage of the extensive opportunities available. Consider how you can adjust your team’s structure to accommodate new roles and new technology initiatives. You need to act now before market conditions change or competition wins out. Download this eBook: The Essentials of Digital Innovation and learn the essentials of driving digital innovation, including how you can create a faster path to transform ideas into winning solutions.